California's Sterling Caviar to be sole caviar participant at highly-anticipated and now sold-out FOOD & WINE Classic in Aspen, Colorado, this Father's Day Weekend, June 15-17. Considered the father of sustainable sturgeon farming and sturgeon caviar production, Northern California-based luxury brand Sterling Caviar will climb nearly 7,900 feet in elevation as it returns to Colorado to showcase its lineup of products to a combined audience of celebrity chefs and affluent consumers during the highly-anticipated and now sold-out FOOD & WINE Classic in Aspen this Father’s Day Weekend, June 15-17. Located in California’s farm-to-fork capital of Sacramento, Sterling Caviar is no new-comer to the artisan food scene. Having recently celebrated its 35th anniversary, Sterling Caviar is the country’s first and leading boutique producer of sustainably-farmed white sturgeon caviar. Likened to the buttery texture and nutty taste of the finest Osetra, Sterling Caviar is utilized by some of the world’s leading chefs. 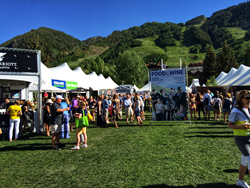 Now in its 36th year, the FOOD & WINE Classic in Aspen is respected publication FOOD & WINE’s annual signature event and serves as a who’s who of culinary icons and wine, beer, and spirits experts like Anne Burrell, Tyler Florence, Jacques and Claudine Pépin, Ray Isle, Jordan Salcito, Marcus Samuelsson, and Andrew Zimmern, among others. An expected audience of 5,000 targeted consumers and industry decision makers is expected to enjoy three days of unsurpassed hospitality and culinary experiences at more than 80 scheduled demonstrations, seminars, and tastings. The weekend also marks the 30th anniversary of FOOD & WINE’s annual “Best New Chefs and Restaurants of the Year” issue. In good company with nearly 200 wine, food, and luxury lifestyle brands, Sterling will provide the sole caviar representation at each of the Grand Tasting events over the course of the three-day celebration weekend. Throughout the weekend’s now sold-out Grand Tasting events, attendees are invited and encouraged to visit Sterling Caviar who will be located in the East Pavilion, table E105. Located in California’s farm-to-fork capital of Sacramento, Sterling Caviar is America’s pioneer of sustainable sturgeon farming and sturgeon caviar production, and is the nation’s leading producer, supplying the majority of its domestic caviar production annually. Consistently recognized for its sustainable farming practices and long-term protection of the species, Sterling’s caviar is exclusively produced from white sturgeon (Acipenser Transmontanus) – a species native to North America’s west coast. From hatching to maturity, its sturgeon are farm-raised entirely in controlled environments by a committed staff of fish biologists and specialists. Sterling Caviar offers four premium grades of caviar – Classic, Royal, Supreme, and Imperial – in tin sizes ranging from 30g to 1000g. Until recently, much of Sterling’s caviar was designated for repackaging and distribution through one of the world’s largest and most premier caviar houses. Today, Sterling’s caviar is distributed directly, its high quality quickly making it a favorite among some of the country’s finest restaurants and resorts.